On this date in 1941 Japanese citizens celebrated the 15th anni­ver­sary of the suc­ces­sion to the Impe­rial Throne of Emperor Hiro­hito (post­humously referred to as Emperor Shōwa), according to tradi­tion the 124th direct des­cen­dant of Jimmu, the legen­dary first ruler of the Empire of the Rising Sun. Fes­tive toasts invoked the Impe­rial reign, 2‑1/2 weeks after Japan pro­voked the United States into war against that coun­try and its Axis part­ners, Ger­many and Italy. Half a world away, people all over Ger­many cel­e­brated Christ­mas as best they could. Because the new religion of the Reich was Nazism, Ger­mans were for­bidden to send Christ­mas cards, or even New Year’s greetings, which had become a co­vert sub­sti­tute, allegedly because they wasted valu­able paper. Adolf Hitler’s minis­ter of infor­ma­tion and czar of public com­mu­ni­ca­tion, Joseph Goeb­bels, for­bade radio sta­tions to play Christ­mas hymns except for “O Tannen­baum,” whose words made no refer­ence to the Christ­ian holi­day. Trees were scare and candles rationed, so even the 200‑year‑old Ger­man tradi­tion of placing gifts around a lighted tree on Christ­mas Eve took a drubbing. There wasn’t much worth cele­brating, it seemed, any­way. To the east, in a white Russian nether­world where tem­per­a­tures stood at 36° below zero, fuel froze, ma­chine guns ceased firing, Ger­man soldiers lacking cold weather gear died from severe frost­bite, and only a few replace­ments for worn-out men and mate­riel were avail­able. 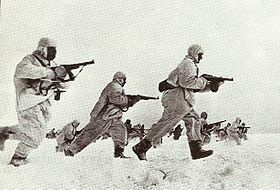 (The same cold weather, typical for the sea­son, hit Soviet troops and equip­ment, but they were better pre­pared.) The Nazis’ June 1941 in­va­sion of the Soviet Union, Oper­a­tion Bar­ba­rossa, and their planned Octo­ber coup de grâce, Opera­tion Typhoon, which aimed to knock the Soviet Union out of the war by cap­turing its capi­tal and largest city, Mos­cow, had ended in a single recon­nais­sance bat­tal­ion cap­turing a bridge over the Moscow-Volga Canal and glimpsing the fabled spires of the Krem­lin 14 miles in the dis­tance—this on Decem­ber 2, 1941—but that’s as close as any­one in Hitler’s army ever got to the end goal. Facing a slew of battle­field rever­sals and limited un­sanc­tioned with­drawals by his gen­er­als in the first three weeks of Decem­ber, Hitler assumed com­plete con­trol of the battered Wehr­macht six days before Christmas in an effort to forbid further shameful episodes. 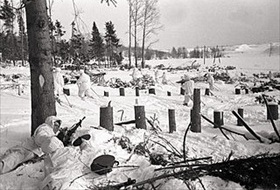 Left: Camouflaged Soviet soldiers on the forest’s edge in the Moscow region, December 1941. 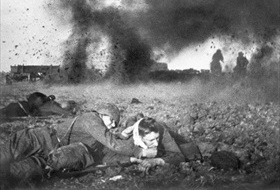 Right: Soviet soldiers during a counterattack on German positions during the Battle of Moscow, December 1941. 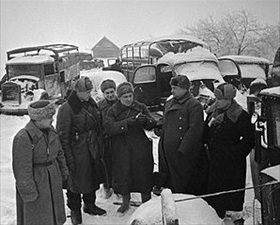 Left: The commander of the Soviet 16th Army, Lt. Gen. Konstan­tin Rokos­sov­sky (second on left), and his staff examine captured German vehicles, December 10, 1941. 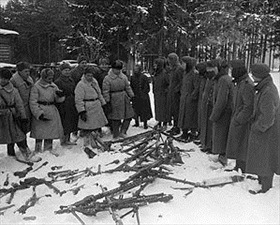 Right: Remains of a defeated Nazi unit after its surrender, December 20, 1941. Left: Fighting in the vicinity of Moscow, September 21, 1941. 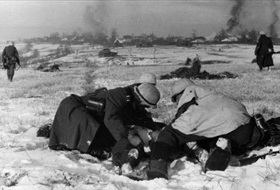 Right: Germans evacuate their wounded in the winter of 1941 against the backdrop of a burning Russian village near Moscow. 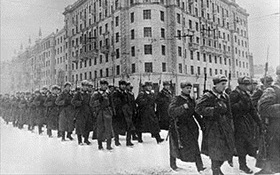 Left: Fresh Soviet troops march through Moscow on the way to the front, December 1, 1941. 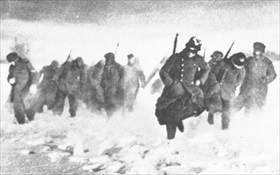 Right: German soldiers during the retreat from Mos­cow, 1941. The num­ber of casu­al­ties on the Soviet and Ger­man sides is open for debate, partly because the dates for the Battle of Mos­cow (as it is known in Russia) or Opera­tion Typhoon (Ger­man offen­sive against Mos­cow) are var­i­ously given and partly owing to the elas­tic scope of battle. Per­haps the best approach is to say that esti­mated casual­ties be­tween Septem­ber 30, 1941, and Janu­ary 7, 1942, range from 174,000 to 400,000 for Army Group Cen­ter and from 650,000 to 1,280,000 for the Red Army. Regard­less of the huge spread between the low and high num­bers, the battle for Moscow must be con­sidered among the most lethal battles in World War II.